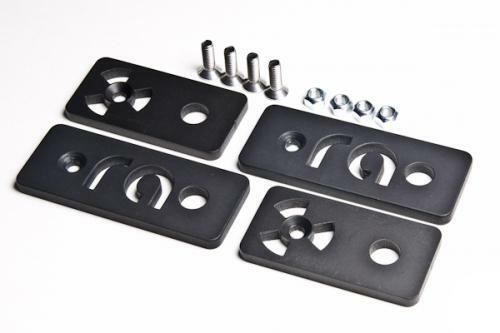 This kit was designed to replace the factory Lotus Exige steel body shim spacers (shown below) with a permanently secured lightweight alternative. The factory Lotus shims can be a nuisance if the clamshell is removed frequently. Because the shims are taped to the rear subframe, they easily lose their adhesiveness and alignment with the 4 trunk mounted through holes. They can also slip out from underneath each other and get lost. 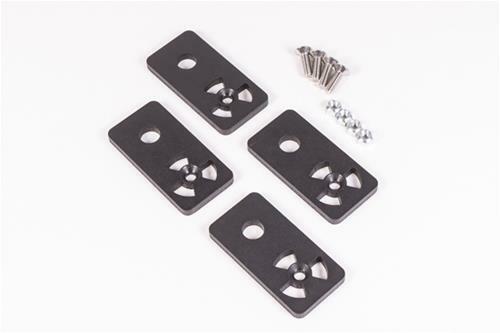 This kit fixes these problems by permanently securing the Radium shims with a flat countersink screw and locking pinch nut. The shims start with 5052 aluminum plate and are laser cut with lightweight features. They are then vibratory tumble-deburred in house and anodized black to protect the surface from oxidation. This makes for a weight savings of 73% from stock. Note: the thickness of the shims are consistent and may vary slightly from the factory shim stack, but no noticeable difference in body fitment can be seen. Comprehensive instructions are included with the kit. This manual includes details on removing the Exige rear clamshell, installation of the shims, and additional information on further improving the removability of the rear clamshell. Initial removal will take 1.5 to 2 hours. However, with some modifications, as detailed in the manual, the process can be reduced to 10 minutes or less. The aluminum Radium shims bolt in place for a more permanent solution using stainless steel countersink hardware.